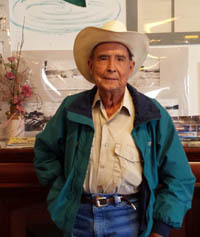 Express photo by Pam Morris Rancher Bud Purdy, 95, will be honored as the grand marshal of Wagon Days 2013. This year’s Wagon Days Parade will celebrate the Wood River Valley’s escape from the raging Beaver Creek Fire that just two weeks before choked the area with smoke, scared a lot of Hailey people out of their pajamas at 3 a.m. and threatened to force Ketchum officials to call the whole thing off. Grand Marshal Bud Purdy is glad the fire didn’t ruin the party. The 95-year-old Picabo rancher knows something about going on after getting knocked around a bit. His maternal grandfather and two uncles homesteaded what became the 12,000-acre Picabo Livestock ranch in the town of the same name that lies just south of Bellevue. They spotted the land around Silver Creek when their Kilpatrick family construction business was building the railroad line from Shoshone to Hailey in 1882. The three brothers took up three homesteads of 640 acres apiece and improved them enough under the provisions of the 1862 Homestead Act signed by President Abraham Lincoln to gain title to them in 1889. They knew a little about homesteading because they had acquired the second homestead ever granted by the U.S. government in Beatrice, Neb., where Purdy was born in 1918. Purdy knows the story of the ranch by heart. And he knows every inch of it along with its water rights, its wells, its cattle, and its store, which sits on a well-traveled state highway and is a center not only for neighbors and travelers, but also the fishermen who seek out the big trout in the famous waters that run through it. When he started visiting the ranch during summers as a kid, it was a three-day drive on a lot of gravel roads from his home in Redlands, Calif. He and his brother spent those summers in a couple of sheep camps the ranch wasn’t using. At 10 years old, the ranch set him up with a team of horses and he drove them around. As the head of several major construction companies, one of which helped build the Hoover Dam, his grandpa knew about work. After getting a degree in business at what was then Washington State College in Pullman, Purdy had a job waiting for him at the ranch. After five years, the ranch foreman quit during World War II. “I had to take over the ranch. I was pretty young then, but there were 8,000 sheep, and raising lambs and cattle. The Draft Board wouldn’t accept him because the U.S. government needed people to work farms and ranches to support the war effort. Purdy knows one end of a horse from the other. He laughs when he tells about a story he read recently about a guy who fancied himself a horse trader who thought he’d gotten a great deal until he got the horse home and found out its tail was glued on. Purdy paid the price for that familiarity. He said a horse never bucked him off, but about 20 years ago he was riding into the ranch at a full lope when his horse started bucking. The ride separated his pelvis by nearly 5 inches and he spent a month on his back in bed unable to walk. Even so, Purdy says, he never thought of himself as a cowboy even though ranch life became his life. What he didn’t enjoy were the tough times he had making the ranch work, especially when the ranch owed a lot of money. In retrospect, he also chuckles about dodging a little gunfire when a ranch hand went haywire with a 30-30. “It’s about a couple hundred yards from the bunkhouse to the cookhouse, and he got that gun and shot it off at the cookhouse (where everyone gathered in the morning) but we couldn’t get out because every time you’d open the door, he was shootin’. Purdy didn’t spend every day on the ranch. The list of local and state organizations that have recognized his service is long and distinguished. He chaired the Hailey Hospital Board for 20 years and helped guide development of the nursing home. His other activities spanned the state: Chairman of the Idaho Association of Commerce and Industry 1982-83; Idaho Cattleman of the Year in 1987; president of the Idaho Cattlemen’s Association in 1977-78; president of the University of Idaho Foundation in 1984-85; Soil Conservation Service’s 50th anniversary award in 1985; and U.S. Forest Service’s 75th anniversary award in 1980; and member of the National Bureau of Land Management Advisory Council from 1980-92. He also received an honorary degree from the University of Idaho. Part of his legacy, too, is helping protect Silver Creek from development by granting a conservation easement to The Nature Conservancy that protects five miles of the deep, slow-flowing stream. A cow ended this handsome, dignified man’s riding days about six years ago. But he’s still moving, which he says is the key to staying healthy while getting older. These days, he likes to read, mostly history, geography and current events. He does a stint each day talking to people at the Picabo Store, where he’s a popular figure as he relates ranch stories and tales of his friendship with author Ernest Hemingway in between reports on what’s doing on the ranch. His favorite activity? Flying his plane, of course. He keeps passing his physical and a biannual examiner’s inspection when a pilot must prove he can fly. He says his vision is good—he doesn’t even wear glasses. More often, people see the dust from the tires of his pickup trailing behind as he drives off to inspect the ranch—still his second favorite part of any day. The city of Ketchum, the Ketchum-Sun Valley Historical Society and the Wagon Days Committee will host a Grand Marshal Party to honor Bud Purdy Thursday, Aug. 29, from 5:30-7 p.m. in Memory Park, on Main Street in Ketchum. The event will feature live music, as well as free food and drinks from Atkinsons’ Market. Everyone is welcome to join in the kick-off celebration of Wagon Days. For more information, call Taylor at 726-8118.